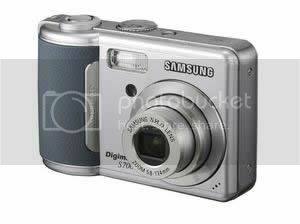 The Samsung Digimax S700 is a 7 megapixel digital camera with optical zoom of 3x featuring a 2.4-inch LCD. The S700 from Samsung provides 16MB of internal storage and includes features like voice recording for up to one hour, voice memo and One-touch Playback” which instantly playbacks an image even if the camera is shut off. The Samsung Digimax S700 should be available during August 2006 at a retail price of around $249.99 (USD). No current news of if and when the camera will be available in Blighty.